Our hand carved marble fireplace mantels are truly a work of art and surly will be the focal point of your great room, your study or any other room. Find a design that you like. This could be based on one of the examples on our web site, or a photograph, picture or any design, ideas, concepts or sketches you have. Use the Key to Dimensions to help in getting the correct measurements. Include any special requirements or additional details you would like add. Contact us, either by email [email protected] or by fax 1 517 349-0917 with designs, dimensions and ideas. Include or attach a photograph or refer to one of the fireplaces on our website. 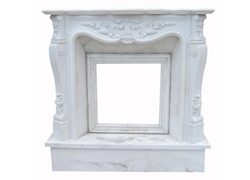 We will send you a free quote for producing your unique hand-carved marble fireplace. It will take about 6 to 8 weeks to carve the fireplace surround. A 30% deposit is required to start the project. Payment can be made by credit card, PayPal or bank transfer.